Affordable Teardrop Rings We Promise You’ll Love Wearing! Finding new jewelry to add to your collection is exhilarating! The hunt to find the perfect shape, size, and color of gemstone for your ring can be almost overwhelming – there’s so much out there! Especially when you not only have to think about the stone itself, but the type of metal the ring’s made of and the style of metalwork, it can feel like you’re stuck in a sea of jewelry without any way to make a decision. But fear not, because today we’re going to share one of our favorite ring styles with you – the teardrop! 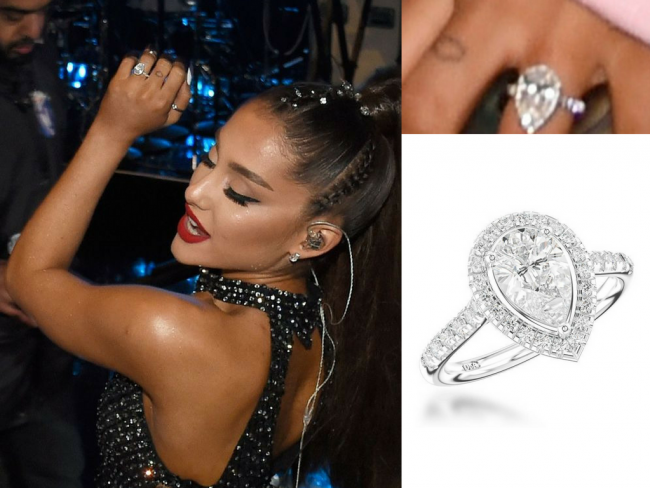 You’ve probably seen them on some of your favorite celebrities: Ariana Grande and Paris Hilton both sport some impressive teardrop engagement rings. It’s an incredibly popular style of ring trending with celebrities right now. Teardrop rings may seem like a modern invention, but this pear-shaped cut of gemstone was first designed by Lodewyk van Bercken in 1475. Bercken is responsible for many innovations in jewelry history; in fact, he’s the reason we have symmetrical cuts in gemstones today. He invented what is known as the scaif, a polishing wheel that uses a combination of diamond dust and olive oil to polish facets of a diamond symmetrically. This polishing technique allows for the best light refraction of a diamond, revolutionizing the diamond trade and sparking popularity for this magnificent gemstone. Through his advanced research into faceting technology, Bercken paved the way for new and exciting jewelry styles. Before his invention of the scaif, facets tended to be uneven, and while gems from before Bercken’s invention were still beautiful, many of them lacked the sophistication and sparkle that modern-day gemstones have due to this method of polishing. Thankfully, this technology was brought to other gemstones later, allowing us to enjoy the beautiful shimmer and fanciful teardrop shape with nearly any type of stone. Speaking of diamonds, one of the most famous pear-shaped gems in existence is the Taylor-Burton diamond. 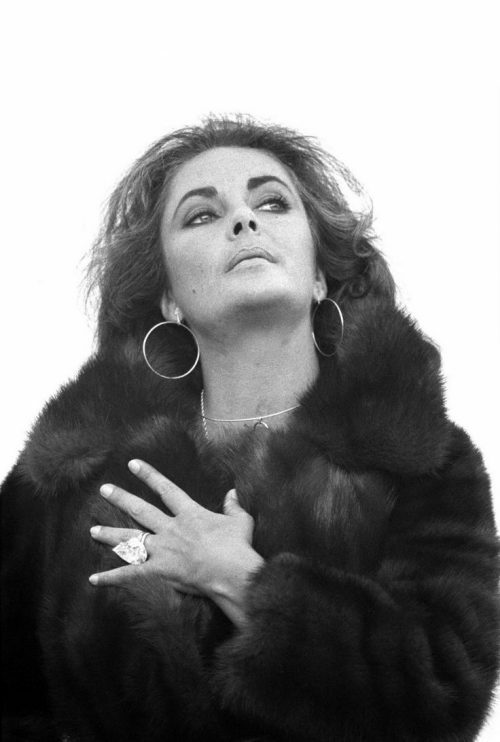 It is a massive 69.42 carat pear-cut diamond given to Elizabeth Taylor as a gift from her then-husband Richard Burton. Sold for nearly $1.1 million in 1969 (over $7.6 million in today’s value,) it was placed into a necklace for Elizabeth Taylor, which she wore for the first time for Princess Grace of Monaco’s 40th birthday. While the Taylor-Burton diamond wasn’t put into a ring as it was too large, the radiance from this style of cut can be found in teardrop rings today! In addition to Elizabeth Taylor, many other celebrities such as Anna Kournikova and Victoria Beckham wear teardrop style rings, and even royalty such as Princess Charlene of Monaco wear one! If you’re looking to emulate their elegance and beauty, a teardrop ring is definitely a great place to start! In addition to a teardrop ring’s timeless appeal, there are benefits to selecting this style of ring over another. Teardrop rings tend to make your hands look slimmer, as the shape of the gem elongates your fingers and minimizes the width of them depending on the size and ratio of the gem. To gain this effect, you would want to wear the ring with the pointed tip facing towards your fingernail. 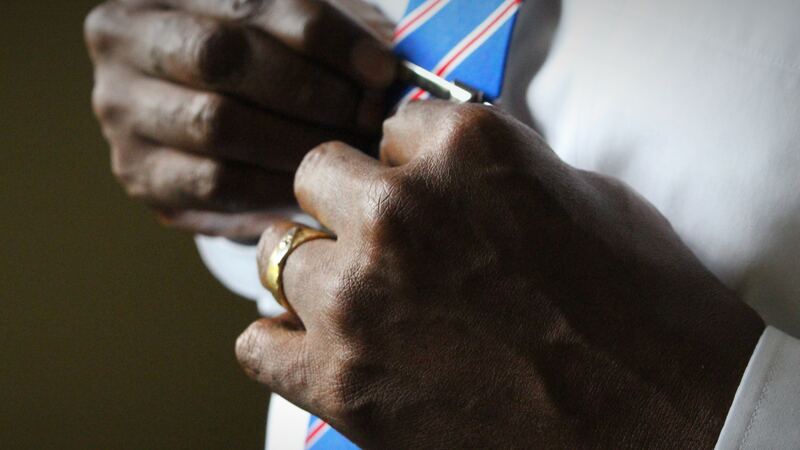 However, that is not a hard and fast rule, and you can wear the ring facing the opposite direction if you feel it is more suited to your personal style. Those who wear teardrop-style rings are thought of to be adventurous, fun, and unique. This style tends to be worn by those who are free-spirited and go against the traditional cuts of gemstones, which tends to be more round or square-shaped gems in rings. It’s definitely a ring to wear when you want to stand out! The best part is that teardrop rings are extremely flexible with how they can be worn. While the pear-cut is considered a fancy shape, these fancy-cut gems are not only reserved for special gatherings, but for casual wear as well. Selecting a teardrop style ring can be a daunting task at first, but we’re here to help – we’ve selected ten affordable teardrop style rings for you to check out below. A few rings mentioned here are made of non-traditional gemstones, which typically are not faceted, however they make stunning statement pieces that can be worn with many different outfits. 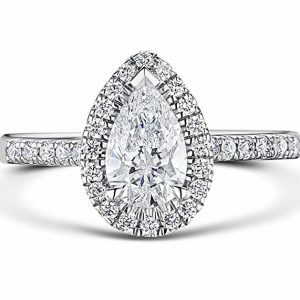 The others will be gemstones that are cut much like the gorgeous Taylor-Burton diamond mentioned above, so they’ll be sure to sparkle just as brilliantly thanks to that stunning pear-cut shape. Regardless of what type of stone you desire in your teardrop ring, you’ll be sure to find something that resonates with your style (and budget!) perfectly. Talk about stunning! This beautiful sterling silver ring has a whopping 2.5 carat pear-cut simulated diamond, surrounded by a halo of smaller simulated diamonds, with matching pave along the band. This teardrop ring has so much fire and sparkle in it, it’s hard to ignore! As a bonus, the genuine .925 sterling silver is coated with rhodium, protecting the silver from tarnish and everyday wear. 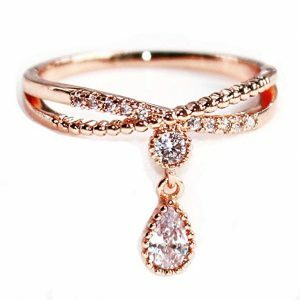 This teardrop ring exudes elegance and style not unlike Katherine Heigl’s own engagement ring. Even better, it’s less expensive than it looks, making it a perfect choice as a gift for yourself, or someone special. While this ring could be worn as an engagement ring, it’s also appropriate to wear as a statement ring for a night on the town. You wouldn’t need a lot of other jewelry while wearing this, as it’s impressive enough on its own. The best part? 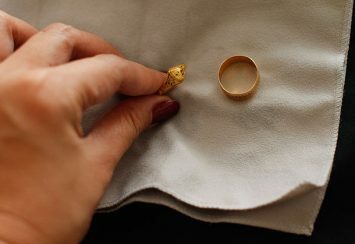 Care for this ring is very straightforward and simple: clean with soapy warm water and a soft brush, and dry with a soft cloth. 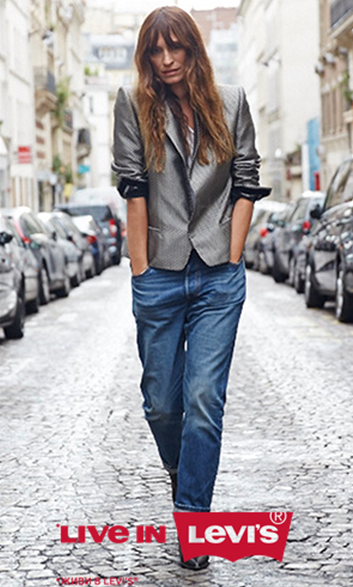 That’s it – it’s super easy to keep it sparkly. This ring will let you become the envy of your friends, all while keeping your wallet happy! Looking for something a bit more whimsical? This .925 sterling silver gemstone ring features a beautiful motif of dragonflies inlaid with conflict-free natural diamonds. In addition, you can choose between either a bright blue sapphire or a deep green emerald for the main center stone. While both stones are simulated, they do not have any treatment added to them, which means that maintaining the luster of this ring will be incredibly easy. 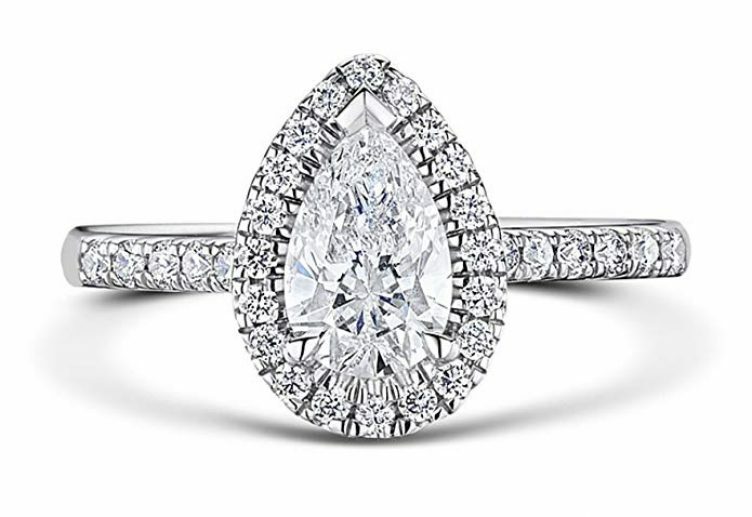 Surrounding the center stone is a halo of incredibly brilliant (and still conflict-free!) diamonds. With a total gem weight of almost 2.4 carats, this cute, lightweight ring will be an excellent edition to your jewelry collection. Whether you choose to dress more formally or wear a simple button up shirt and jeans, this ring will match your own personal style no matter the occasion. Cleaning this ring is simple – just use soap and warm water and clean the dirt off with a soft toothbrush. Don’t use any harsh chemicals or jewelry cleaners, as emeralds and sapphires can become damaged from them. 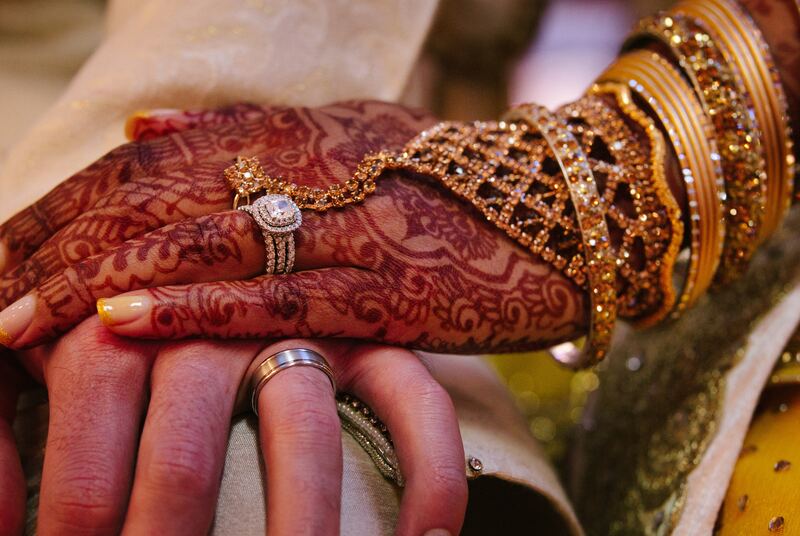 If you treat your ring with care, it will keep on shimmering for you! Looking for something a little warmer in color? This amber teardrop ring from Peora should catch your eye! Moving away from traditional faceted gemstones, this ring’s center stone is made of genuine Baltic amber, which is known for its deep, cognac color. An interesting fact about amber is that it’s not a gemstone, but fossilized tree resin from extinct coniferous trees. The age of amber can be anywhere from between 2.6 million and 65 million years old. Not only are you wearing a beautiful piece of jewelry, but you’re wearing a piece of the earth’s history on your finger! Pretty cool, isn’t it? Made with .925 sterling silver, this ring features a unique metal design. The teardrop is oriented horizontally, versus the traditional vertical placement, surrounded with an asymmetrical bypass-style halo. The stone itself is nearly an inch big – perfect for a statement piece. There are a large amount of inclusions in this amber, which while generally undesirable in gemstones, give this ring much more sparkle and “fire” than you would typically see with a clearer amber piece. To keep your amber looking beautiful, you only need to wash the ring with warm, soapy water – much like most jewelry – and polish the amber with a bit of olive oil and a soft cloth. This helps maintain that luster you’ll see when you first put it on. 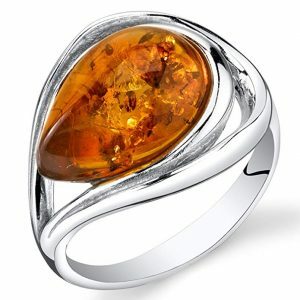 You can be assured that the amber in this ring is one of a kind, making it a great conversation piece. This ring is a bit different than the traditional teardrop styles, but that’s certainly not a bad thing! With an eye-catching teardrop charm dangling from the center of the ring, it’s reminiscent of a belly-dancer’s chain, and is absolutely gorgeous for the price point. 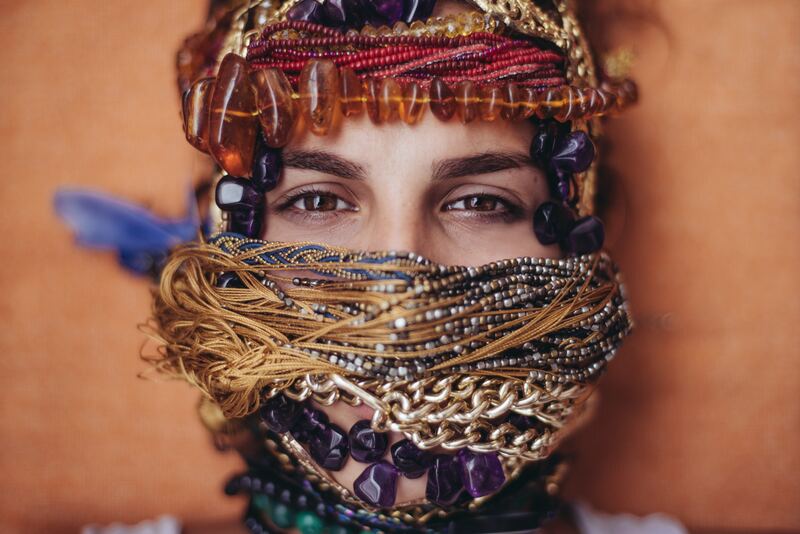 If you’re looking to add more bohemian flare to your jewelry collection, this is one you don’t want to miss out on. This exotic style of ring lends itself to both casual and romantic settings, so whether you’re hanging out on the beach in your sundress, having a girls’ night out on the town, or out on a date, you can be sure this will compliment your style, no matter what you’re doing. With a choice between either 14k a rose gold or white gold-plated base, you can pick which metal suits your skin type more. 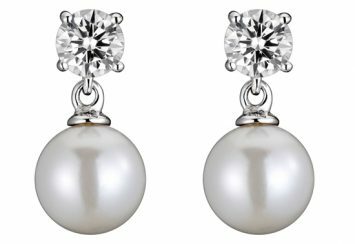 The gemstones are made with cubic zirconia giving you a diamond-like luster without the huge price tag. A huge benefit of cubic zirconia is that it’s easy to clean: simply use warm, soapy water with a soft brush (a toothbrush will do,) and dry off with a clean cloth. 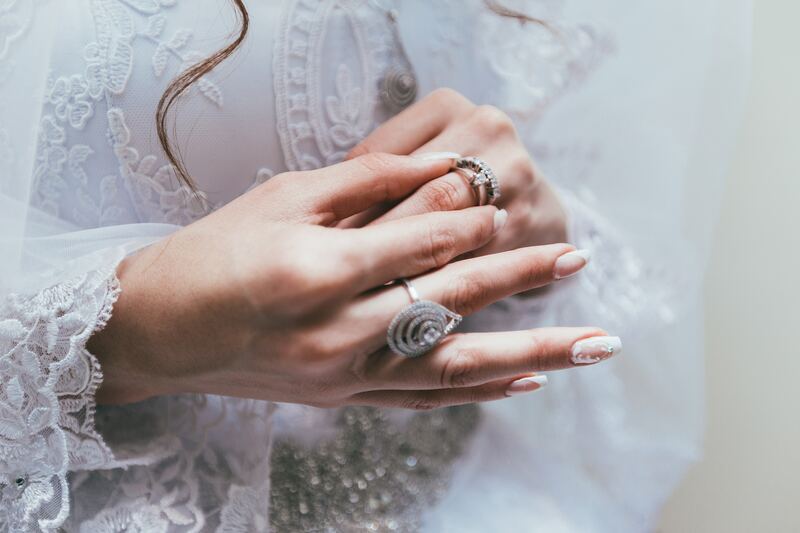 As with any plated jewelry, be sure to wait until any product you place on your hands (such as lotion) is dry before putting on your jewelry, as it could cause a chemical reaction with the metal and change its color. You also want to take care not to do chores or shower with it on to preserve the polish of the metal. 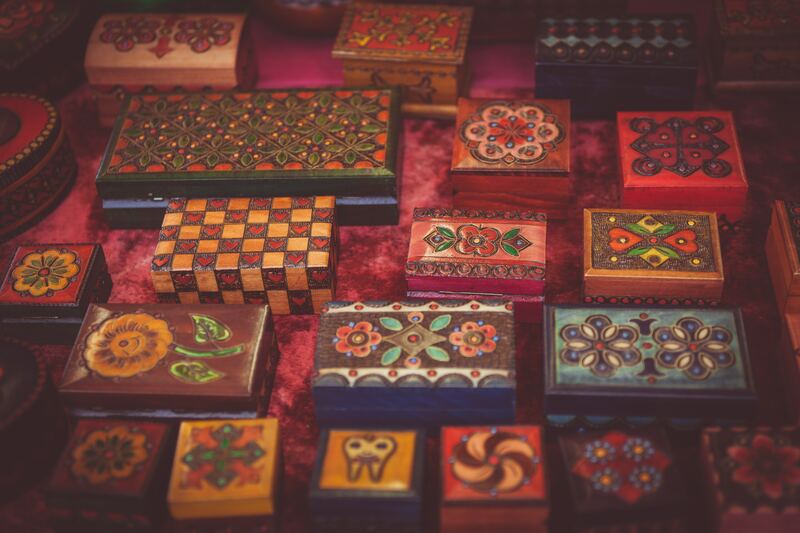 However, that’s advice that should be taken for all of your pieces of jewelry to keep them in as beautiful condition as the day you received them. If you’re looking for a bit more color in your metal, this dazzling white topaz ring mixes 10k yellow gold with sterling silver to create a striking two-tone ring. The center stone is white topaz, boasting an impressive 1.5 carats, and has diamond accents framing the main gemstone. 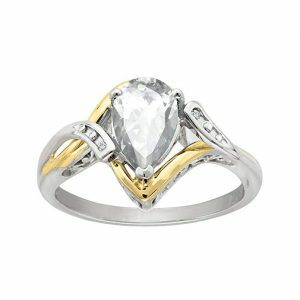 This sophisticated ring exudes class and would be something you want to wear for a special occasion. It would go excellent with a bright floral dress, matching the yellow toned gold with the colors that pop. you could also pair it with a little black dress – the two-tone gold would stand out and make an excellent focal piece in your ensemble. As topaz is softer than some other stones, you must take care in cleaning it. Do not expose it to sudden temperature changes, harsh chemicals, or high heat, and delicately clean the stone with soapy, warm water and a soft brush. We love topaz – it comes in a variety of dazzling colors including white, yellow, pink, and blue. Topaz is also November’s birthstone, so if you’ve got a birthday coming up soon, what better way to celebrate than to treat yourself (or hint at a gift!) What’s great about white topaz is that it has a shimmer not unlike a diamond – a great alternative if you don’t want to spend a lot of money, but still want to get that sparkle! Topaz is generally associated with love, strength, and intelligence. It makes a perfect companion as a piece of jewelry if you’re looking to enhance those qualities within yourself. Agates are a stone with an amazing story – most were made during ancient volcanic activity when the earth’s continents had just begun to form. They are a type of banded chalcedony, formed when gases would get trapped in the rocks. These created pockets filled with silica, which is what quartz is made from. As the rocks cooled, the silica mixed with other minerals trapped within those gas pockets, continuing until all the silica was used up in this process. That’s how agates get their beautiful band structures. If you’ve ever had a chance to visit the Great Lakes region in the United States, you may have seen a small agate or two on the beach! What’s unique about this ring is that it’s a black agate – it may look like an onyx, but the difference lies in the band structures! While onyx typically has straight, parallel bands, black agate has curved bands. Set in sterling silver, brass, and copper, this chunky ring will stand out, no matter what you wear. 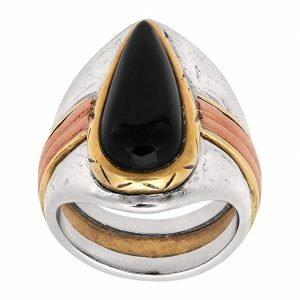 The black agate is surrounded by notched brass, giving this Silpada ring a southwestern-inspired vibe. It would make a great addition to a flowy outfit in subtle earth tones – think boho chic! It’s definitely a piece you want to wear while groovin’ at a music festival or touring a local farmer’s market. The best part? Caring for your agate ring is super simple! Much like topaz, you want to keep your agate ring away from hard chemicals. As agate is a porous stone, it can be damaged by water and other cleaners. Simply use a soft cloth to clean your gem. Aquamarine has been an important part of human history for centuries. Ancient Romans believed it to help the owner maintain friendships, as well as absorbing the feelings of love. Grooms during that time even gave it as a gift to their new bride after marriage! During the medieval era, aquamarine was thought to reignite the love between married couples. Sumerians and Egyptians thought of it as a stone that brought happiness and everlasting youth. Aquamarine was even worn by sailors for protection at sea! While aquamarine can come in many different shades, the blue hue we typically associate with the stone is the most valuable. With so much positive energy surrounding the aquamarine, it’s certainly one you should have in your collection. We love this ring, not only for the gorgeous 5x7mm (.7 carat) blue aquamarine, but for the halo of diamonds surrounding it! That halo effect really makes this ring shine, and with the band lined in diamonds as well, the entire ring shimmers and sparkles with radiance. The ring is made of genuine .925 sterling silver and coated with rhodium to protect the silver, giving the metal a bright shine. An advantage to Aquamarine is its durability in normal wear, and requires minimal cleaning using warm, soapy water. 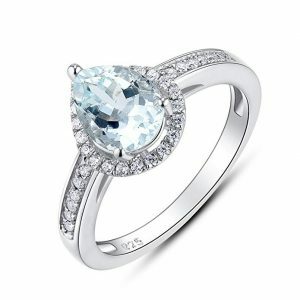 You’ll be able to keep this beautiful, light blue gem sparkling easily! Peridot is a stunning olive-green gemstone that’s gaining popularity in recent years. The birthstone of August, Peridot has often been associated with light, protection, and the well-being of the owner. It’s also one of only two gemstones formed in the upper mantle of the earth. Guess which one is the other? It’s diamond! Peridot was often mistaken for emeralds in ancient times, and historians speculate that Queen Cleopatra’s extensive emerald collection may have actually been peridot that came from Egypt. Another feature of peridot is that they don’t tend to get darker in lower light, so their sparkle can still be seen even by candlelight. 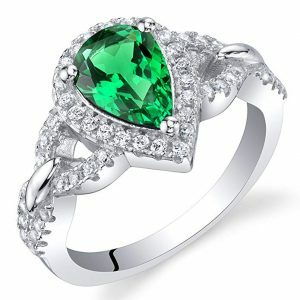 This Peora ring we found for you captures those amazing qualities with an extremely rich green hue and dazzling sparkle. 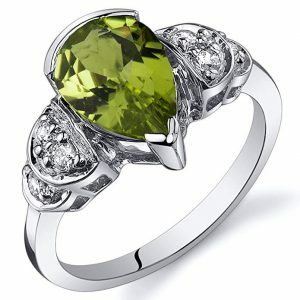 The stunning 1.75 carat peridot is seated in rhodium-treated .925 sterling silver, giving the metal a bright luster. Surrounding the main stone are tiered pools of super sparkling cubic zirconia, which only adds to the dazzling sparkle of the crystal-clear peridot. This unique setting is sure to gain compliments from family and friends! Caring for your peridot ring is easy – simply use warm, soapy water and a soft cloth! You can even use most jewelry cleaning chemicals you find in the store to keep is clean. Did you know that there’s a magical stone that changes its color from blue and green to red and purple depending on the lighting? Don’t believe me? It’s real, and it’s called alexandrite! Alexandrite was first discovered in 1834 by a Finnish mineralogist named Nils Gustaf Nordenskiöld in the Ural region of Russia. At first, they thought it was an emerald due to it being located inside the emerald mines near the Tokovaya River. However, it was later discovered to be a color-changing variant of the mineral chrysoberyl. As it was discovered on the day that Alexander II (the future tsar at the time) had become an adult, he became its name sake. In addition, red and green were the colors of Imperial Russia, which made the stone a favorite among many royal members of Russia. Today, these stones are thought to bring good luck, love, and fortune among the wearer. Thankfully today we can synthesize this magnificent gemstone, making it affordable for everyone. This beautifully cut 7×5 mm (.7 carat) alexandrite stone is placed in between two natural diamonds. And what better way to have it than in a metal of your choosing – you can choose between 14k rose, yellow, or white gold! 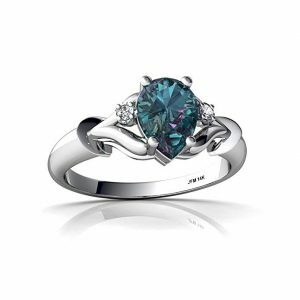 Since Alexandrite is such a hard gemstone, it doesn’t need any special cleaning methods. Just simply clean with a bowl of water and some soap. You can even clean it with an ultrasonic cleanser, making care for this nearly effortless. Make sure you give this magical gemstone a home in your own collection. This is absolutely our favorite ring this list. Trust us, you’ll fall in love with alexandrite the moment you see it! Last, but certainly not least in this list, is another dazzling ring from Peora. This sterling silver ring comes adorned with icy white cubic zirconia along the band, surrounding the center stone in a teardrop halo. The setting is a bypass style with accent stones lining the band as well, making this a dazzling display of sparkles! What kind of stone is in the center, you ask? Any one of the nine (yes, nine!) choices they have available. If you like warmer colors, you can select citrine, created ruby, garnet, and even padparadscha sapphire! If you’re unfamiliar with that type of sapphire, don’t worry: it’s one of the rarest sapphires in existence. Notable for its mixture of pink and orange hues, this ring could have a padparadscha sapphire in a head-turning deep pinkish-orange. 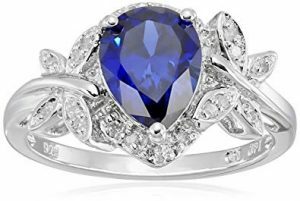 However, if you’re more inclined towards the cooler end of the color spectrum, you’ve got a choice between amethyst, peridot, blue topaz, created blue sapphire, and simulated emerald. There are so many different gemstones you could have in this gorgeous ring, it’s hard to pick which one to get! As you can see, teardrop rings are incredibly versatile – not only is it suitable for a casual afternoon lounging in your most comfortable clothes but can be worn when you’re all dolled up and out on the town. These rings can also be funky and fashionable too, so you’re never left with something that isn’t fitting to the occasion. Whether you’re looking to emulate a celebrity’s engagement ring style, have a unique statement piece, or just fill out your jewelry collection with timeless appeal, you’ll always find a teardrop ring that meets your needs. Our favorite part about teardrop rings is that they can stand out enough to where you can build an entire outfit around them! If you want the ring to function as the focal piece, such as that stunning simulated diamond ring (#1) or the alexandrite ring (#9), wear a basic black dress – you could even add a bit of cherry red lipstick for that vintage look. You could also wear subdued colors to make the more vibrant rings stand out more. You can even color coordinate your outfit with the ring itself, matching a color in your outfit or other pieces of jewelry to that of the gemstone, such as an emerald green belt with a silver buckle to match your silver and emerald green ring (#2)! If you choose to go with a funkier ring, try and match the patterns in your outfit with that of the ring – think bohemian chic with the agate ring (#6) above. With all these beautiful rings to choose from, it’s hard to pick just one! Which one in this list is your favorite?